Layer fruit and pudding for a nutritious and delicious dessert! Add milk to pudding mix and prepare according to directions on box (instant pudding may be substituted). 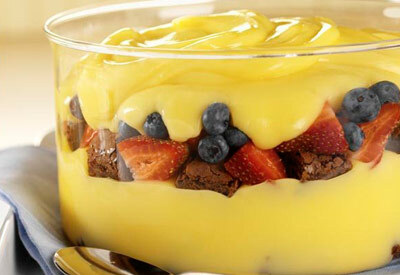 Place half of brownie pieces on bottom of a medium glass bowl and layer with half of vanilla pudding, 1 cup of strawberries and 1/2 cup of blueberries. Repeat layers with remainder of ingredients. Serve immediately or cover and refrigerate. If fresh berries are not in season, you can use frozen berries that have been thawed.